Testicular torsion is the twisting of a testis (testicle) such that the spermatic cord becomes twisted, cutting off blood flow to the testis. The testes are suspended in the scrotum by a single bundle of tissues called the spermatic cord. Normally this bundle of tissue holds the testes in place. Each testis receives blood through the spermatic cord. When the testicle is not held firmly in place it can twist, creating a kink in the spermatic cord. When this happens blood supply to the testis is cut off. The resulting situation is an emergency, because the testis will die within hours if the blood supply is not restored. There is approximately one case of testicular torsion in every 4,000 men under age 25 in the United States. There are two times in life when torsion is most common, although it can occur at any age. Testicular torsion is most common in the first year of life and during adolescence . Torsion is more common in adolescents that it is in newborns. Testicular torsion is caused by the rotating of the testicle is such a way that the blood flow to it is cut off. Symptoms of testicular torsion are sudden severe pain in the scrotum, swelling and/or discoloration of the scrotum, nausea , and vomiting . Approximately 40 percent of patients with testicular torsion reported having a similar pain sometime before, but at that time the pain resolved without treatment. Testicular torsion is an emergency, and the child should be taken to the doctor or emergency room immediately if he shows the signs or symptoms of testicular torsion. The chance that the testicle will be saved is directly linked to how long the testicle is without blood flow. If the torsion occurs for less than six hours, there is a high chance the testicle can be saved. If the torsion occurs for more than 24 hours, it is very unlikely that the testicle can be saved. The doctor usually first performs a visual examination of the scrotum. The affected testis may appear to be slightly higher than the unaffected one. The scrotum may be swollen or discolored. If the doctor is unsure, diagnostic tests may also be performed. One such diagnostic test is a nuclear scan of the scrotum. In this procedure, a tiny amount of radioactive fluid is injected into the blood and detected as it flows through the scrotum and testicles. Torsion is indicated if the radioactive fluid does not flow through the sore testis. Ultrasound scan accompanied by a contrast agent can also be used to diagnose testicular torsion. Other diagnostic tests may be performed to help the doctor determine if torsion has occurred. A rare condition, testicular torsion occurs when the spermatic cord is twisted and cuts off the blood supply to the testicle. so that it cannot rotate again. This securing is called orchiopexy. The other testicle is also secured during the surgery to prevent future testicular torsion, because children who have had one episode of testicular torsion are likely to experience it again. If the testicle has not been untwisted in time and is dead, the surgeon will remove it. While waiting for surgery, the doctor may try to restore blood flow to the testis by hand. This can help to save the testis if surgery is not possible right away. Surgery is still necessary, however, even if blood flow to the testis has been restored, because it is very likely that torsion will occur again. If the torsion is relieved within six hours, it is very likely that the testis will recover normal blood flow and function. If the torsion continues for more than 24 hours, it is unlikely that the testis can be saved. One testis is all that is necessary for normal growth and maturation, as well as normal fertility later in life. The only way to prevent torsion is to surgically anchor the testes so that they cannot move. This is frequently done after an occurrence of torsion, both to the torsed testis and the unaffected testis. Testicular torsion is usually very painful. If the torsion is not corrected quickly, the testis usually loses function. Only one healthy and functioning testis is required for normal growth and development and for normal fertility later in life. 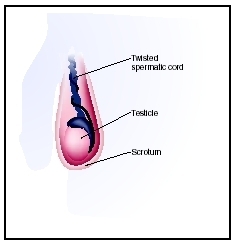 Scrotum —The external pouch containing the male reproductive glands (testes) and part of the spermatic cord. Spermatic cord —The tissue that suspends the testis inside the scrotum. Adelman, William P., and Alain Joffe. "The Adolescent with a Painful Scrotum." Contemporary Pediatrics 17 (March 2000): 111. Kirn, Timothy, F. "Time Is Critical with Testicular Torsion." Family Practice News 34 (April 15, 2004): 86. Little, Cindy. "Testicular Torsion." Nursing 30 (April 2000): 33. American Urological Association. 1000 Corporate Blvd., Linthicum, MD 21090. Web site: http://www.auanet.org. Paushter, David. "Testicular Torsion." eMedicine , July 20, 2004. Available online at http://www.emedicine.com/radio/topic683.htm (accessed December 1, 2004).